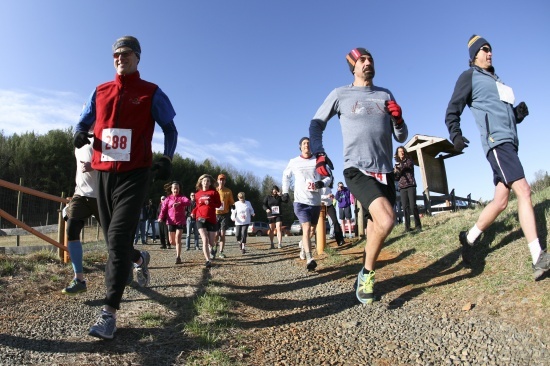 Runners are off for the 2014 Matthews Trail Run! Brain Miller, first finisher overall, crossing the creek with ease! Second place overall finisher, Josh Lozoff, scaling the trail! 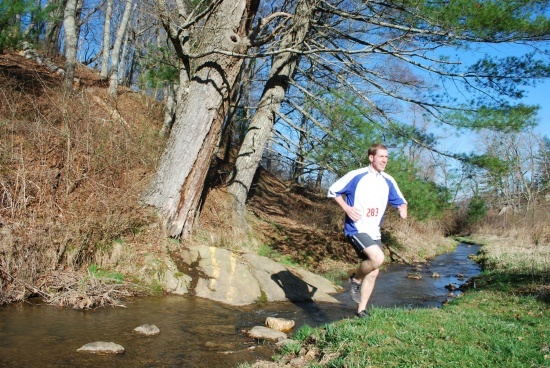 Tom Sharkey, our third place overall, jumping the creek! Tom Sharkey, our third overall winner enjoying his run! Leslie Bird, first place overall female scaling the heights! First overall female, Leslie Bird, incredible jump across the creek! Second place overall female, Anita Nemick, running intensely focused!! Third overall female, Billie Hall, looking great on the trail! Larry Bohs, 1st place age group winner running well! Danny Harmon giving a peace sign as he tackles his run! Ed Hanks leading the way! Josh Lozoff makes a great landing! Patti Merdian exemplifies muscle power! Larry Bohs jumping the creek! Patrick makes the creek with ease! Billie Hall giving this thing some thought. Ramona Hale bravely crosses the creek! Anita Nemick nearing the finish line! Danny Harmon happily crossing finish line! Tom Sharkey upside down on finish line! Tom Sharkey joyously completes somersault across the finish line!!!!!! Relaxing in a beautiful environment waiting for awards ceremony to begin. Teresa presenting Josh Lozoff 2nd Overall Male award. Danny Harmon receives generous gift certificate from Galax’s Applebees. Mike Hutchison gives Billie Hall well deserved water coming up a long hill. Karen Porter gives our overall winner, Brian Miller his plaque. Teresa presenting Josh Lozoff his second place overall award. Many thanks to Baywood Rescue Squad represented by Matthew Patton and Lee Felts. We appreciate you guys!! Larry Bohs making this hill look enjoyable. Beautiful background! Brian Miller, our overall winner with a good looking plaque he just received! Tom Sharkey with a beautiful scenic backdrop behind him. Billie Hall with her 3rd overall female award. How about this for scenic beauty?? Great “water girls,” Allyson Mountcasel, and Dae Lindberg! Leslie Bird admiring her first place female overall award! Teresa Roberts is owner of Masterpiece Fitness, and a Certified Personal Trainer, Group Fitness Instructor, WaterArt Instructor, Water Rehabilitation Specialist, Sports Conditioning Specialist, and Cancer Exercise Specialist. Please check out her website @ masterpiecefitness.com. Find Masterpiece Fitness on Facebook. For questions, comments, or appointments, email: [email protected], or phone 276-236-8748, (cell) 276-237-6680. Exercising in the Spring Rains! Masterpiece Fitness serves the Galax and surrounding Twin County area, including Hillsville, Woodlawn, Carroll County, Grayson County, Independence, Fries, Baywood, and even Sparta.